Registration deadline is Friday, February 18. We are pleased to have Mr. Paul Kent, President & CEO of the Greater Halifax Partnership, and a Fellow of the Canadian Information Processing Society, speak about the importance of economic growth, key industry sectors, the role of Halifax as a hub city to drive growth in surrounding regions through clustering of industry, universities and research, and talent issues and strategies. Mr. Kent will speak to the role of the Greater Halifax Partnership in these endeavours and of his acclimation to the position of President & CEO. Paul A. Kent is the President and CEO of the Greater Halifax Partnership, a catalyst for economic growth and confidence in Greater Halifax. Paul has over 30 years of experience at executive and senior management levels, in both the public and private sectors. Previous positions include Senior Vice President, Bell Aliant, Chief Operating Officer, xwave and Senior Vice President of Strategic Consulting, Fujitsu Canada. A natural collaborator, Paul builds lasting relationships and thinks long-term. He believes in the power of partnership, and in embracing, rather than avoiding, risk. His enthusiasm and belief in people and the community in which he lives is contagious, and he loves a challenge. 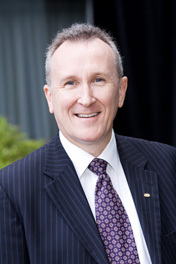 Paul is a Fellow of the Canadian Information Processing Society, a Certified Management Consultant, a Member of the Institute of Corporate Directors and has twice been named one of Atlantic Canada’s Top 50 CEO’s by Atlantic Business Magazine. He holds a Bachelor of Science from Saint Mary’s University in Halifax. Paul is an active member of the local business community. For six years he served as a Director at Nova Scotia Business Inc., the Province’s business development agency. Currently, he is a Director at AnyWare Group and the Maritime Tidal Energy Corporation. He is also deeply involved in the cultural and social fabric of the area. He serves as Vice-Chair of Listen to the Future, Symphony Nova Scotia’s Endowment Campaign and as a Director of the Symphony Foundation. He is also Community Gifts Chair for the Mental Health Foundation of Nova Scotia’s Opening Minds Capital Campaign, President of the Dartmouth United Soccer Club and a Warden of the Anglican Church of Saint Andrew in Cole Harbour. Paul’s background in business, along with his long-standing reputation as a champion for the Greater Halifax community will prove invaluable assets as the Partnership continues to accelerate the economic growth of our region. Paul lives in Dartmouth with his wife, Barbara and two daughters, Julia and Jessica.